With less than 2% of the funds in hand to build the Knik Arm Bridge, the Knik Arm Bridge and Toll Authority (KABATA) has in the last few months plowed ahead acquiring property, hiring more consultants, and broadcasting statewide ads about a “fresh start” with “peer review” for the project. However, KABATA’s new work protects its ability to do transportation planning separately from existing transportation planning agencies and ensures that the new data will not be reviewed by the Anchorage Metropolitan Transportation Solutions (AMATS) this year. A November 3, 2013 front page Anchorage Daily News article [ Dead link- this article is no longer online ] quoted KABATA’s deputy executive director Judy Dougherty saying “the project is a go” though the legislature has yet to approve financing for the project. So despite over a million spent in consulting work for the “new” socioeconomic population and employment data, it remains likely that when the legislature convenes again in January, 2014 legislators will again face non-reviewed data on the project’s financial feasibility. Ready to Demolish Homes and Businesses? Dueling Compass pieces in the Anchorage Daily News questioned and defended the prudence of KABATA acquiring property and announcing plans to demolish Government Hill acquired structures either this fall or next spring. First, in this compass piece,[ Dead link- this article is no longer online ] new Government Hill Community Council President Stephanie Kesler asked how an agency that had spent $85 millio of its original $112 million federal earmark could be acquiring property when the legislature has repeatedly denied further state funding for the KABATA-estimated $1.6 billion needed to build the bridge. She accused KABATA of trying to create “an aura of inevitability” for a project that has “no realistic prospect” of being financed. In reply,[ Dead link- this article is no longer online ] KABATA Executive Director Andrew Niemiec described the Bridge as “a State of Alaska project” that had to follow a “strict, formal process” to fairly compensate property owners. Perhaps ironically in a state whose officials often complain about federal overreach, Director Niemiec mentioned that the Federal Highways Administration (FHWA) had “selected” the Erickson Street route on Government Hill for the Anchorage approach. “Approved” may have been a more accurate description of FHWA’s role in the project than “selected,” since the route and project right of way funding were triggered by an August, 2011 State of Alaska funding request to FHWA. While KABATA’s push to acquire and demolish property appears to try to create some physical evidence on the ground showing the Bridge is inevitable, the Government Hill Tesoro and Subway have separate long term leases from another state agency, the Alaska Railroad. Permit Status: Where’s the Governor? Aside from two state agencies flashing separate green and yellow lights on acquiring project right of way, Governor Parnell gave a guarded response to a question on his commitment to the bridge at the Wasilla Chamber of Commerce last week. Governor Parnell said the necessary permits were “years away” and said the legislature needed to focus on projects that could be built immediately. See here (OR view an archived copy here) for more details. While the Bridge has received a Record of Decision on its Environmental Impact Statement, KABATA has been in discussion with the National Marine Fisheries Service (NMFS) for a Biologic Opinion for the incidental taking of fish and beluga whales during construction and with the Army Corps of Engineers for a Section 404 permit. For two years, KABATA Board minutes disclose that those NMFS and Corps permits are likely to be soon issued. But to date, no NMFS or Corps 404 permits have been issued. Concerns from the Army Corps of Engineers and presumably NMFS were a key factor in KABATA’s to lengthening the planned bridge span by a 1000’ to 9200’ in 2011. The proposed Bridge is now longer than San Francisco’s Golden Gate Bridge. It may be the Governor knows that to get its final permits from the Corps and NMFS that the bridge will have to be lengthened from 9200’ up to 14,400’ which would greatly increase the cost of the project. Or it may be that the governor has no information on where permitting stands but just did not want to take a stand on the costly project in an election year. The “fresh start’ in KABATA’s statewide radio ads refer to the expected role of new consultants, Cardno and Agnew:Beck to revise socio-economic data to project new population, household, and employment data by neighborhood or traffic analysis zones (TAZ) out to 2055. That work was scheduled to be completed November 1st. What KABATA has avoided mention of, is that when the new data is produced, it will then be turned over to KABATA’s same traffic and revenue consultant CDM Smith whose previous work was discredited by the 2013 Legislative and Budget Audit, to model the new traffic and revenue numbers which will result in revised toll revenue numbers. Those revised toll numbers will then be used by KABATA’s existing financial consultant CITI, to produce a revised financial plan. In the last quarter (7/1/13-9/30/13), KABATA has spent $201,784 on work by those retained consultants, CDM Smith and Citi. It is not yet clear if in effect, the new sausage ingredients of revised socio-economic data are to be fed into the same black box traffic model to produce essentially the same financial plan. All previous KABATA “pro forma” financial plans since 2009 have shown a federal TIFIA loan of $300-500 million and the revenue from about 36,000 vehicles a day crossing the Bridge around 2035 or twice the ISER-CH2MHill estimate. Both the federal loan and the higher amount of traffic are necessary in order to try to demonstrate that the project could eventually pay back a proposed state loan. This year’s Legislative Budget and Audit (LB&A) review of the project criticized the undocumented and overly optimistic data of the work of CDM Smith and Citi as well as the demographic data. In May, 2013 financial analyst Jamie Kenworthy made a brief presentation to the AMATS Technical Advisory Committee (TAC) asking that by end of 2013, the TAC produce a TAZ map for 2035 Anchorage Transportation Plan that includes a tolled Knik Arm Crossing. The updated 2035 AMATS TAZ map could then be compared to the new 2035 TAZ data from the new KABATA consultants. This would allow the public and the legislature to come to their own conclusions regarding the reasonableness of the numbers behind KABATA’s expected new financial plan. The TAC discussed making a TAZ map public by the end of the year, but took no action. While KABATA describes the new socioeconomic consultants as coordinating with AMATS, Anchorage, and the Mat Su Borough, there is no requirement in the KABATA RFP for the product of that new work to be consistent with existing transportation plans. Nor is there any process yet identified to reconcile different KABATA traffic forecasts with the 2035 AMATS Anchorage Transportation Plan numbers. Nor is there a requirement that the cost of the KABATA Bridge to be included in the AMATS 2035 plan as requiring future transportation funding. In recertifying AMATS in 2011 as the Metropolitan Planning Organization (MPO) for the Anchorage area, the FHWA urged KABATA, AMATS and affected units of local government to work together to insure consistent population, traffic, and coordinated financial plan for both the Bridge project and all other Anchorage area transportation improvements. The AMATS TAC has invited KABATA to present its plans to the October, November, and December TAC meetings as a step to the coordinated planning expected of a MPO that FHWA has pushed for. KABATA has refused the invitation to those last three TAC meetings of the year. Evidently the “peer review” promised in the KABATA radio ads does not include include Anchorage’s traffic planning body, AMATS or indirectly the Federal Highway Administration (FHWA) as peers. Last year before the 2013 legislative session, KABATA Chairman Michael Foster served as the public spokesman for the project by writing opinion pieces in the state’s papers and speaking to the Resource Development Council. KABATA’s 2012 Annual Report [ Dead link- the KABATA website is no longer online ] featured supportive quotes and pictures of Anchorage Mayor Dan Sullivan and Mat Su elected officials. But the glossy 14 page report omitted the names of KABATA Executive Director Andrew Niemiec and CFO Kevin Hemenway. Perhaps in response to the rough treatment of Chairperson Foster by House leaders in their attempt to transfer the bridge project from KABATA to AHFC, the Anchorage Daily News Compass piece and Resource Development Council project update were undertaken by KABATA Executive Director Andrew Niemiec. In neither the News column nor the RDC presentation — which included a slide “By the Numbers” [ Dead link- this presentation is no longer online ] — did Executive Director Niemiec provide KABATA’s latest cost estimate for the project. In the November 3rd Daily News article, [ Dead link- this article is no longer online ] KABATA cited a $710-$750 million project cost. When reporter Lisa Demer cited the project cost as $1.6 Billion from KABATA’s last public finance plan of December, 2012, KABATA explained the roughly $900 million difference as financing costs and a proposed $150 million state loan. However, KABATA’s lower number of $710-750 million was for Phase 1 that included only 2 lanes on the Bridge. But since the Phase 1 low number also included the revenue from four full lanes of traffic from 2021 to 2051, KABATA had to include four lanes on the Bridge and approach roads in the December, 2012 estimate. This resulted in the project cost jumping $600 million from that one item alone. Summary: Same Old, Same Old? For the current fiscal year starting on 7/1/13, the Legislature provided a 27% increase to KABATA’s operating budget which has allowed the agency to increase its profile through paid statewide media and hire new consultants and rehire old consultants to redo the work criticized by the April, 2013 LB&A audit. A revised financial plan is likely to show again a $300-500 million federal TIFIA loan they have recently again been turned down again for now the sixth time. While there may be new socioeconomic data projections, that data will have modeled by the same traffic and revenue consultants with the likely expected result that the project will again show apparent financial feasibility. Unless KABATA changes course in terms of sharing data with AMATS and the public, there will be limited ability of knowledgeable non-KABATA experts or the public to critique the assumptions behind the revised KABATA financial plan. 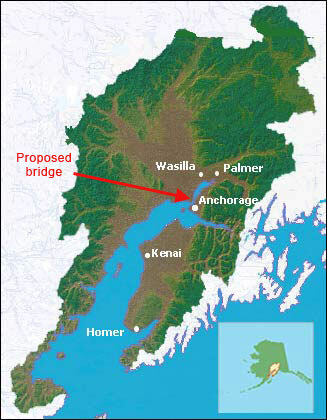 Without the permits that set the length and likely cost of the bridge and without having performed the additional drilling that KABATA geotech consultant Shannon and Wilson recommended in 2009 to establish the depth of the unstable Bootleggers Clay in Knik Arm, any KABATA cost estimate for the Bridge will need to be set in a wide range. So when the legislature faces the annual KABATA request for a full state guarantee to make up the toll shortfall, legislators will again be asked to make more than a billion-dollar decision with non-reviewed information. It will be as if the 2013 LB&A audit never happened. In short, another $4-5 million in state transportation funds will have been expended in the last year but little will have changed about the prospects for the $1.6 billion plus project. The Alaska Legislature’s April adjournment left KABATA without the state guarantee needed to move the project forward. As a result, in an attempt to appear responsive to legislator concerns, KABATA has launched a flurry of activities. However, the result will most likely be another numbers gridlock in the legislature. Recent KABATA activities are listed below with italics highlighting the departures from standard practice that foreshadow next year’s expected legislative train wreck. First, in response to the LB&A audit, KABATA announced that they would hire a new firm to review and revise the socioeconomic data of previous contractors that led to a traffic and revenue forecast that the LB&A audit characterized as undocumented and overly optimistic. On May 22, KABATA issued a press release [ Dead link- the KABATA web site is no longer online ] asking for proposals for a mere 2 weeks later to produce new projections of populations, households, and jobs by traffic analysis zones (TAZ), or neighborhoods, for the 2015-2040 period as well as to revise the 2012 baseline data for Anchorage and Mat-Su. The RFP asked for baseline data due by 7/31/13 and a final report by 8/15/13; this requires significant data gathering and analysis to be performed relatively quickly. This rushed schedule is apparently necessary so new demographic information can be used to produce a new traffic and revenue forecast to replace the Wilbur Smith and Associates Toll forecast that was discredited by the legislative audit as undocumented and unreasonably optimistic. AMATS, the State and Municipality of Anchorage joint planning committee is the federally designated Metropolitan Planning Organization (MPO) for the Anchorage area and as the MPO, it produced the traffic analysis zone (TAZ) data of people, households and jobs by neighborhood that underlies the adopted 2035 Metropolitan Transportation Plan. Curiously, the KABATA RFP Statement of Services (see page 13) requires the contractor to consult with numerous organizations but not AMATS, the Municipality of Anchorage, or the Mat Su Borough. The RFP makes clear the KABATA product is to be an “independent” forecast and analysis from data used by Anchorage and the Mat-Su Borough. The practical effect of this RFP is to ensure that KABATA will continue to do separate planning based on what they expect to be higher growth numbers than are used as the basis for current South-central transportation plans. In effect KABATA will not need to coordinate or accept the population and job forecast of existing transportation plans or the role of AMATS as the MPO. On May 9, 2013 Jamie Kenworthy briefed the Technical Advisory Committee of AMATS on lessons from the LB&A audit, the growth in the Bridge cost, and the need for KABATA to work with AMATS to produce transparent traffic analysis zone data on population, and household, and job numbers. Those analyses would have to be complete by the end of the year in order for the legislature to have a single set of demographic assumptions in front of them or, if KABATA’s assumptions differ, the reasons why the estimates differ. The AMATS committee briefly discussed the feasibility of updating their current TAZ data and releasing it to the public by the end of the year but no commitment was made. During the discussion of the 2035 update to the Anchorage Transportation Plan in 2012, Municipality of Anchorage, consultant Jon Spring produced data and maps showing the KABATA’s and AMATS differing KNIK Goose Bay Road and Point MacKenzie population and job projections. But because Mr. Spring’s presentation was during a TAC work session, those materials were not made public and no mention of the discussion is available in AMATS minutes. A third planning project is also underway with Tom Brigham of contractor HDR Inc. working with the Mat-Su Borough on early plans for a Wasilla bypass between the general areas of Glenn-Parks intersection and the Parks Highway-Big Lake turnoff. Before recommending a general route for the bypass, Brigham is updating land use changes based on the 2010 Census, revising the TAZ data for the Mat Su Borough, and using the traffic model AMATS used in preparing their 2035 Anchorage Plan to project future demand. And what Bridge assumption is HDR using in assigning traffic flowing north-south through the Anchorage-Mat-Su area in planning a possible Wasilla bypass? Rather than model both a Bridge or no Bridge scenario or having to show a lower volume of Bridge traffic than predicted by KABATA numbers, Brigham is threading the needle by following the Bridge assumption in the Anchorage 2035 Plan. The adopted Anchorage Plan included the Bridge with the now discredited approximately 36,000 trips a day in 2035 that KABATA projects but only through the manipulation of modeling the Bridge as no toll facility to make the high number look more feasible. Research shows that tolls reduce demand significantly and on average drivers will choose a 5-8 mile detour to avoid paying them. There are no current plans for a non-toll Bridge – the choice is toll Bridge or no Bridge — so plugging an impossible condition into the HDR traffic model could compromise the data used to plan the Wasilla bypass project. Meet the New Consultant, Same as the Old Consultant? On April, 23, 2013 KABATA Board Chairman Michael Foster told the KABATA Board that given the LB&A audit, KABATA was prepared to redo the demographic and traffic data to provide the legislature with accurate data. Foster contrasted the “micro approach” the LB&A traffic consultant took with the “macro approach” KABATA’s consultants chose. Interestingly, Chairman Foster appeared to have telegraphed KABATA’s intent to stick with the larger discredited growth model for the Mat-Su Borough by stating that Knik-Fairview will be the fourth largest city in the state. KABATA Board members Transportation Commissioner Kemp and Revenue Commissioner Butcher were both present at the April Board meeting and they referenced discussions with the Governor’s office to second the Chairman’s indication that KABATA needed to provide accurate data to the legislature. Neither Commissioner indicated if they agreed or disagreed with the Chairman’s apparent conviction regarding a high growth scenario for the Mat-Su Borough. On June 12, KABATA announced that Australian firm Cardno Inc. in association with Anchorage firm Agnew::Beck had won the up to $150,000 contract to provide new TAZ data with a final report (now due 9/30/13). Funding Confusion in Transportation Planning? KABATA has now spent over $75 million of the original approximate $114 million. While the original federal earmark is now state funds that can be spent on any eligible transportation project, the Federal Highways Administration (FHWA) has to approve the release of those funds for the new $150,000 consultant contract. On June 25, 2013, former Government Hill Community Council President Bob French wrote FHWA, (click here for the letter) reminding them that in their 2011 recertification of AMATS as the Metropolitan Planning Organization, FHWA strongly suggested the KABATA project be integrated with Anchorage Transportation Plan, including a budget showing how Bridge and non-Bridge improvements were reasonably likely to be funded from expected revenue. French’s note asked how FHWA could have federal funds now underwrite KABATA’s separate planning function and demographic data without KABATA being required to coordinate with AMATS. To date, FHWA has not responded to Bob French so it remains likely that federal funds will continue to underwrite three apparently uncoordinated planning functions that could well be based on three different sets of TAZ data on neighborhood population and job numbers: the new KABATA contract, the Wasilla bypass study, and the existing AMATS transportation plan based on TAZ data that may or may not be updated before the end of the year. Without FHWA intervention on the new KABATA contract, a more proactive AMATS, or a new commitment of KABATA to coordinate with other agencies and units of government, it remains likely that the confusion of numbers on future regional population and job forecasts will again be dumped on the legislature when they reconvene in January, 2014. Citing “a decade of waste,” on June 26, 2013, Washington DC-based Taxpayers for Common Sense awarded the Knik Bridge project its non-coveted Golden Fleece Award, see here for the press release. In reaction, KABATA said that “nearly all” of the claimed $715 Million cost for the Bridge would be paid for by Alaskans. Click here (OR view an archived copy here) for reporting on KABATA’s response. Despite a flurry of activity at the end of session which at one point promised to pass a bill that would launch the project and at another point threatened the existence of KABATA, the legislature adjourned without passing any legislation on the project. Opponents of the project could take heart that without passage of HB 23 with its implicit state guarantee of an unlimited amount to make up for the toll shortfall and without the $10 million the Governor requested in the capital budget, the project lacks financing and so cannot move forward with an RFP or win a needed federal loan. Bridge supporters can be grateful that KABATA has a 27% increase in its operating budget that will allow more PR and outreach to sell the project in the coming year. What is clear is that a majority of the legislature, at least rhetorically, supports building the Knik Arm Bridge but that same majority, at least in the House, is opposed to the extra expense of a public-private partnership versus direct state bonding. There appears to be a majority of legislators leery of KABATA continuing to manage the project, at least partly as a result of what the audit committee called KABATA’s “unreasonably optimistic” toll forecast. A review of the legislative action in both houses reveals interesting fractures within and between both political parties. The drama of trying to get HB 23 through the House before the Legislative, Budget and Audit Committee (LB&A) released the audit came to a head on April 6. HB 23 had eked through House Finance on April 3 with Co-chair Rep Bill Stoltze (a co-sponsor of the KABATA Bill) gaveling down questions from his fellow Republicans and at one point calling a recess when it appeared there were not the votes to pass the bill. HB 23 survived the committee with Republicans Neuman, Stoltze, and Tammie Wilson voting pass and six representatives voting to amend, Democrats Kawasaki, Gara, and Edgmon and Republicans Munoz, Holmes, and Costello, and Republican Steve Thompson with no recommendation. The Committee was uneasy with HB 23 establishing a process for KABATA annually to certify how much working capital, overhead, administrative costs, and contractor payments they needed because then the legislature would face a tough dilemma. Either rubber stamp that amount or not appropriate the funds and trigger a likely downgrade of the state’s credit rating. For a discussion of the moral obligation language in the bill, click here for attorney Susanne DiPietro’s testimony. On April 5 the LB&A meeting on the audit was moved from 9 AM to 5:30 PM while the House was scheduled to take up the bill at second reading at 11 am, both on Saturday April 6th. However, HB 23 was not taken up for a floor vote that morning, and the Rules Committee chaired by Craig Johnson (R-Anc) re-scheduled the bill on the House calendar for final vote on April 8. The release of the audit that evening and the ensuing media coverage apparently moved enough votes, so rather than the House passing the bill as expected on April 8, the Republicans went into a 5 PM caucus that day and emerged to take the highly unusual step to send the bill back to the Rules Committee. There the Committee rewrote a longer bill by Representative Mia Costello (R-Anc) now called Amendment 1 to CS HB23 (Fin) v.0. The new bill moved the project from KABATA to Alaska Housing Finance Authority (AHFC) while in effect demoting the current KABATA Board to an advisory Board to AHFC for one year before going out of business. For Costello interview, click here [ Dead link- this interview is no longer online ] . Over the next two days the House Rules Committee took the unusual step of holding a limited hearing with only KABATA and AHFC testifying about the practical effects of the revised bill. While HB sponsor Mark Neuman (R-Big Lake) and KABATA Chair Michael Foster pleaded with the Committee not to approve CSHB 23 to gradually abolish KABATA, it was clear that the Republican leadership now backed Rep. Costello’s revised bill. Click here (OR view an archived copy here ) for the Mat-Su Frontiersman coverage. Click here (OR view an archived copy here ) for the Fairbanks Daily News-Miner recap. Click here to read the Alaska Budget Report’s account of the House actions. Copyright Alaska Budget Report. Reprinted by permission. After revised CS HB 23 passed the House at 1 AM on Friday April 12, the Senate Finance Committee that afternoon began deliberations after several days of having the public hearing for SB13 being re-scheduled day after day. But Senate President Charlie Huggins slowed any momentum for the new CS HB 23 by supplying a pro-Bridge witness list to the Senate Finance Committee, and Finance Co-Chair Sen. Kevin Meyers (R-Anchorage), said that he wanted to give KABATA a chance to reply to the Audit findings. Click here (OR view an archived copy here ) to read the Daily News-Miner’s account of Senator Huggins’ reluctance to rush the bill. Senate Transportation Chair Dennis Egan (D-Juneau) had earlier held a public hearing on the original HB 23/SB 13 but when the revised HB 23 got to Senate Finance Committee on April 12, Co-Chair Kevin Meyer (R-Anc) allowed only invited testimony from pro-Bridge advocates. In reply, Government Hill Community Council President Bob French and financial analyst Jamie Kenworthy annotated the Citigroup presentation highlighting three CDM Smith toll projects that have gone bankrupt since completion. Click here (OR view an archived copy here ) to download the annotated document. Click here for a full listing of documents available to the House for deliberations on HB 23. Click here for the full listing of documents associated with the later Senate deliberations. Despite calendaring public testimony on the revised HB 23, the Senate Finance Committee on April 12, took no public testimony, and ultimately took no action on either version of the bridge bill. The legislature session expired before midnight April 14. Both houses did pass the capital budget SB 18 (Archived copy here. ) which contained the Governor’s requested $10 M for the project part of the 4 year $150 M “down payment” KABATA identified last year as necessary to fund the reserve fund for the project. However, section 54 of the capital bill had a contingency making that $10 million appropriation contingent on “enactment into law of a bill creating the Knik Arm Crossing Fund” which was contained in the never-passed CS HB 23. Without the expanded state guarantee and the additional $100 million in private activity bonding authorized by HB 23, and without the $10 M from the capital budget, it is considered extremely unlikely that the project will win the $300-500 million in federal loans necessary to launch the project. Further late session media comment on KABATA’s declining credibility see: This Alaska Dispatch report (Archived copy here. ) and this Frontiersman editorial, (OR view an archived copy here ) and this copyrighted Alaska Budget Report story listing high KABATA salaries, reprinted by permission. The frenetic deliberations on the KABATA bills in the last few days of the session left the media with little time or perhaps less interest in covering four curious developments during that period. 1) Bridge Cost: $1.1 Billion, $1.6 Billion, $2.6 Billion or Unknown? Media accounts seem understandably confused about the cost of the project. During the session which started in January, 2012 KABATA representatives described the total cost of the project at $1.1 Billion, a number based on KABATA’s August, 2012 financial plan. However, the LB&A audit contained a new financial plan submitted by KABATA and dated December, 2012 showing a higher project cost of $1.6 Billion. The new plan included the cost of building 4 lanes on the Bridge in 2026 since apparently the auditor convinced KABATA that it was unreasonable to include the revenue from four full lanes of traffic from 2026-2051 without including the cost of expanding the bridge to four lanes. During all the committee deliberations the legislature did not refer to the $500 million higher cost number. The 4 lanes of revenue, 2 lanes of cost problem was first noted by Jamie Kenworthy in an August, 2011 presentation (see 11/13/11 post below) to the Technical Advisory Committee of the Anchorage Metropolitan Area Transportation Planning Committee (AMATS) but until the LB&A audit was released on 4/6/13 no public entity had acknowledged the extra costs associated with building the additional two lanes. KABATA’s new $1.6 Billion estimate is still based on land use assumptions the auditor found are inconsistent with Mat-Su Borough adopted plans and “unreasonably optimistic” traffic and toll projections. Bridge critics maintain the project cost will be $2.6 Billion (click here to see “Real Cost” paper) but no media stories cited the higher possible number for the project. The auditor deliberately made no project cost figure arguing no estimate was possible until an independent traffic and toll study was done. This summer the Federal Highway Administration (FHWA) is scheduled to redo the now five year old cost estimate. One sign of possibly declining administration support for the bridge project is the changing position of the Department of Transportation and Public Facilities (DOTPF). In past years DOTPF officials have described the bridge as a “high priority” and testified to the legislature in support of the project. Last year DOTPF authored an artfully written fiscal note that said the project would cost $0 contingent upon the KABATA traffic and toll estimates being accurate. The Commissioner of DOTPF did testify before the Senate Finance Hearing on April 2, 2013, but his testimony essentially distanced DOTPF from the work that KABATA was doing. This year’s $0 cost fiscal note was signed by Michael Rovito, KABATA’s new legislative liaison and Andrew Niemiec KABATA’s Executive Director. It might be argued that the legislative record that showing the fiscal note as coming from DOT was technically correct because KABATA is administratively attached to DOTPF. However, the legislative information system listing from the zero cost estimate from DOTPF was misleading because it did not include the $150 million of State Funding for KABATA’s “Reserve Fund”, and did not include the additional $41 million of State Funding that KABATA predicts will be necessary to replenish the “Reserve Fund”, starting in 2031, well after FY2019 which is the last year noted in the “zero fiscal note”. The Department of Revenue also signed a $0 cost fiscal note. It is not clear what has led to DOTPF’s change of heart on the project. Bridge critics had briefed DOTPF on the 4 lanes of revenue and 2 lanes cost problem after 2026 so it may be that they decided they could not sign the $0 cost note even with the broad caveat that it was contingent on the accuracy of KABATA toll projections. Since the draft audit was circulating internally for comment in February, 2013 and the fiscal note appeared a month later, DOTPF probably had advance warning of the audit’s findings and sensed an impending shifting mood in the legislature. The Alaska Department of Revenue (ADOR) is the state’s chief guardian of Alaska’s high AAA/AA+ credit rating from the nation’s three largest ratings firms. On January 7, 2013, just before legislative session started, ADOR released a Request For Proposals (RFP) to select a firm to assess the financial feasibility of the Knik Arm bridge project and asked for proposals in only 11 days. Two firms responded: the New York office of First Southwest Company and the New Jersey-based firm Acacia Financial Group. Both firms had a presence in Alaska. The RFP # 2013-0400-1683 listed a schedule for the expected $25,000-$225,000 contract assumed an award on 2/4/13 for a 1 year contract with two one year possible extensions. The contractor was to “review the reasonableness of the assumptions” of KABATA’s traffic and revenue consultant Wilbur Smith and the Citigroup Financial Plan and “review, verify, and confirm recommended financing structures for the State’s participation in the Knik Bridge Crossing.” Any firm that had done work for KABATA in the last five years was considered a conflict and not allowed to bid on the project. Clearly ADOR was interested at that time in a non-KABATA source assessing the project’s financial feasibility and seeking to independently determine the state’s liability in KABATA preferred P3 structure with the contractor and not the state issuing bonds. The RFP described how the chosen firm would work with KABATA and Deputy Revenue Commissioner Rodell and other state officials in assessing the project and recommending financing options. In February, 2013, Government Hill Community Council President Bob French made a public records act request of ADOR seeking to discover the status of the project. On February 22, 2013 department procurement officer Dorie Choquette informed French that ADOR had “received a protest regarding the Alaska Bidders preference which needs to be researched further by the Department of Law” and so the department had cancelled the solicitation. The response to French’s information request showed that two of three bid reviewers had voted to award the bid to the Acacia firm but it was subsequently learned that the Alaskan bidders protest had been made by competitor First Southwest. Deputy Revenue Commissioner Angela Rodell is Revenue Commissioner Butcher’s designee to sit on the KABATA Board. She was the former Senior VP at the NY office of First Southwest before becoming Deputy Commissioner in September, 2011. She is considered the department’s leading authority on public finance markets. With the protest of the potential award and subsequent late start it was doubtful that significant work could have been performed on the financial feasibility of the project and made public in the last six weeks of session. However, since the contract was for a minimum of a year and presumably the information was still sought by some members within the administration, it is not clear why this delay and protest led to the wholesale cancellation of the solicitation. Deputy Commissioner Rodell did testify in the legislature in support of the project on April 2, 2013 before the House Finance Committee. But, as a result of the canceled procurement, the legislature in its deliberations did not have the benefit of ADOR’s planned independent review of the project’s financial feasibility. 4) KABATA’S Choice: Keep Control or Receive $10 Million and a Possible $300 Million Federal Loan? When the House Rules Committee was debating moving the bridge project to AHFC, KABATA Chair Michael Foster argued that the transfer would dangerously slow the procurement of a contractor to build the project. However, that procurement depended on a state guarantee to cover the toll shortfall and $10 -$150 million in further state funds, as KABATA CFO Kevin Hemenway told his Board in February, to show the necessary state commitment to win a $300-$500 million federal TIFIA loan. Last year KABATA estimated it needed only a $150 million state loan for a reserve fund to launch the project. The Governor’s December, 2012 capital budget request included $10 million for FY 14 as a “down payment” and then projected $35 M/year for 4 years to total the $150 Million. Starting April 9 when KABATA was testifying against the AHFC transfer, the capital budget had not yet passed either House but the draft budget had been released April 6 with a contingency that made the $10 million available only if legislators established a new “Knik Arm Crossing Fund” that session. The only bill that could establish the necessary contingency was CSHB 23 – the same bill that would have transferred KABATA to AHFC. CS HB 23 would preserve the KABATA Board only for a year as an advisory Board to the AHFC Board and presumably KABATA employees could be rehired by AHFC or dismissed as AHFC redid the population, traffic, and financial projections. As a result, Chairman Foster faced a tough tactical choice. Either he could go along with the AHFC transfer in CSHB 23, meet conditions for the $10 million, and increase the chances for a $300-$500 million federal loan that could launch the project. Or he could preserve his own role in the project, at the cost of turning down the $10 million appropriation and essentially ruining KABATA’s chances to get a federal loan (the fate of which he warned the Rules Committee in his argument against the AHFC transfer). Chairman Foster chose the latter course, keeping project control and staff continuity within KABATA at the expense of the project’s financing. Furthermore, the Senate’s ultimate non-action on all bridge bills preserved the agency for at least another year. However, that choice leaves KABATA in a tough place when the legislature reconvenes in January, 2014. While KABATA will still be in control of the project, without any state guarantee or federal loan the project will remain stalled. And KABATA will again have to explain why it has failed for now the ninth time to win a federal TIFIA or TIGER loan. “No evidence was found,” the consultant concluded, “to support the 50% market share” of Mat Su-Anchorage traffic to be taking the Bridge as opposed to the Glenn Highway which would still be closer for the vast majority of Borough residents living in the Palmer-Wasilla area. During hearings before the House and Senate Transportation Committees, KABATA was asked the current cost of the project. The last public financial plan was from August 2012 which estimated a $1 billion cost with half the construction funds coming from a low cost federal loan that KABATA was turned down for a month later. The audit provides a new financial plan from KABATA dated December 2012 with a project cost now up to $1.6 Billion. Curiously, this higher number and revised financial plan did not surface during the March 2013 House and Senate Transportation Committee hearings when KABATA was asked for the project’s current cost. The new higher cost of the project was a result of KABATA having to fix the 4 lanes of revenue, 2 lanes of cost problem that was the basis for James Kenworthy’s complaint to the Inspector General of the US Department of Transportation (see November 7, 2012 post). By including the cost for expanding the Bridge to 4 lanes and connecting to Ingra-Gambell in 2026, KABATA’s new numbers show a cumulative project deficit out to 2046, or 30 years after the Bridge would be scheduled to open. The August 2012 Financial Plan showing 4 lanes of revenue after 2026 crossing a 2 lane Bridge produced a cumulative project deficit only for the first 9 years the Bridge would be open. The consultant did not project a current cost for the project in part because a number of construction risk costs have not yet been defined. Those risks include determining the depth of unstable Bootlegger clay in Knik Arm, estimating the cost of additional earth work necessary in rerouting the East approach to be consistent with the Muni agreement for the road behind the Port of Anchorage, and the cost of a 1,000’ longer bridge. Both the old and new KABATA financial plan still count on a $300-500 M federal TIFIA/TIGER low-cost loan as well as what the LB&A consultant characterized as the unreasonably optimistic toll revenue forecast. The consultant notes that KABATA has been turned down a cumulative 8 times from the federal TIFIA and TIGER programs. The new financial plan includes $97 million in contractor equity, up from $73 million in the old plan. The new, December 2013 plan is a 1 page spread sheet so it does not include the full cash flow analysis present in the old plan. What is clear from KABATA’s new plan is that the investors would be making a financing profit from the first year the Bridge opens. The one piece of good news for KABATA is that the audit found that KABATA had complied with state and federal requirements for public participation in the Environmental Impact Statement and pre-construction meetings. The bad news for KABATA is the consultant’s clear recommendation the traffic origin and destination study and traffic and toll forecast needs to be redone by an independent consulting firm. This would probably take 6-12 months but since the Corps of Engineers has not yet issued a permit for the project, it is not clear if following this recommendation would add additional time to the troubled project even if the state guarantee bill now in the legislature passes. Last week both the Senate and House Transportation Committees heard testimony on identical bills HB 23/SB 13 that would provide a “moral obligation” of state backing for an expected 35 year contract with the contractor as well as for all operating expenses, as defined by KABATA. KABATA’s original statute allowed for a moral obligation of state backing for revenue bonds issued by KABATA, provided that they were rated investment grade (defined as 125% of the Bond Buyer’s Index and approved by the State Bond Committee.) However, the new bills establish a new second reserve fund that the legislature “must” fund. This second reserve fund would include “the Authority’s overhead and administrative costs and working capital” (Section 5 19.75.221 (i) 1 B.) If the bills HB 23/SB 13 are passed they would provide an effective guarantee to an expected 35 year contract of indeterminate size to make annual “availability payments” to the contractor. In testimony to the House and Senate Transportation Committees, KABATA Chair Michael Foster and assistant Attorney General Jeff Stark conceded that the bills’ new language create a moral obligation of the state to fund KABATA expenses. Attorney Susanne DePietro described the effect of the state’s moral obligation to fund the second reserve fund as a “contingent liability” on the state’s balance sheet. DePietro explained that both the size and unprecedented ability of an agency to define its operating and working capital needs would allow KABATA to then present the legislature with a Hobson’s choice: replenish the Reserve Funds or likely face a downgrade by national rating agencies on the state’s debt. Click here to read DePietro’s testimony on the legal issues. It appears that the House and Senate Transportation committees are poised to make their decisions on these bills before receiving important audit information. A 20 day clock started Monday March 11 when the Legislative Budget and Audit Committee meeting in executive session, released the audit’s draft findings on the reasonableness of the project’s traffic and financial forecast to KABATA’s leadership. This is normal procedure for LB&A audits. The audit was commissioned last January, 2012 by then LB&A Chair Representative Mike Hawker. KABATA now has 20 days to comment on the draft before April 4 when LB&A Committee could review the comments and make public the audit findings. If either HB 23 or SB 13 are, passed in any form out of the Transportation Committees, it is currently unclear whether they would be heard by the respective Finance Committees before the audit is made public. The Bridge project could also receive $10 million in funds as part of the state’s capital budget which has not yet been released to the public. Bridge Project Lacks Current Financial Plan and Adds New Geotechnical Risk: New Citizen Estimate $2.6 Billion + $X Factor. Financial analyst Jamie Kenworthy and Government Hill Community Council President and engineer Bob French have developed a revised cost estimate of the Knik Arm Bridge project. The revised estimate is $2.6 Billion “Plus $X” to recognize the new geotechnical risk added to the project based on the draft CH2MHill report on the engineering firm PND’s design and construction problems during the Port of Anchorage expansion. PND also did the 2007 35% design for the Knik Arm Bridge. Click here for the extensively documented Real Cost paper containing the revised cost estimate. A December 2012 exchange of letters between Alaska State Senator Johnny Ellis and Knik Arm Bridge and Toll Authority (KABATA) Executive Director Andrew Niemiec clarifies that the geotechnical risk of not defining the limits of the Bootlegger Cove Formation Clay in Knik Arm – an issue that has bedeviled the Port of Anchorage project – is now to be borne by the bridge developer and not the state. Click here to see Senator Ellis’ letter requesting an updated financial estimate. Click here to see Andrew Niemiec’s response. These developments compound the absurd situation of KABATA having no current financial plan for the project. In September 2012, KABATA’s $500 MM TIFIA low cost loan application was denied by the US Department of Transportation leaving the latest project finance plan of August 2012 missing half of the initial construction funds. This was the FIFTH time that KABATA has been turned down for a TIFIA loan. Other possible sources of revenue, like “Private Activity Bonds” have an average loan rate of 8% versus the low 3% rates from a TIFIA loan. For an annotated version of KABATA’s most recent Financial Plan, click here. The new KABATA bills have been referred to the Transportation and Finance Committees of both houses but hearings have not yet been scheduled. Also still pending is the completion of a legislative audit of the reasonableness of the traffic and toll projections underlying KABATA’s financial plan. The Legislative, Budget, and Audit Committee authorized that audit a year ago. Recent events have increased the odds against the increasingly problematic Knik Arm Bridge project. On August, 24, 2012 KABATA has submitted its fifth “letter of interest” application [ Dead link- the KABATA web site is no longer online ] for a low interest federal TIFIA loan from the US Department of Transportation asking for $500 million in this year’s round. On September 11, 2012 financial analyst Jamie Kenworthy wrote to KABATA CEO Andrew Niemiec and CFO Kevin Hemenway listing the KABATA documents that apparently show that the Financial Plan submitted in the TIFIA loan application reaps the revenue of 4 lanes of traffic but only includes the cost of 2 lanes of Bridge and approach roads. The result, according to Kenworthy, is a misleading bond “cover ratio” of project revenue to projected cost which KABATA uses to portray the project as financially feasible and so able to repay the prospective federal loan. Click here to view the Kenworthy letter. The Kenworthy letter also reiterated the overly optimistic population and traffic information provided and noted the bridge is now 9200’ long (just longer than San Francisco’s Golden Gate) while the cost estimates in the federal application were for a 8200’ Bridge. Kenworthy gave KABATA a chance to correct or comment on any of the cited information before it went public — however, KABATA officials chose not to respond. So 20 days later Kenworthy’s letter was forwarded to federal transportation officials. The Knik Arm Bridge project competes with 18 other TIFIA loan projects totaling $26 Billion. Click here [ Dead link- this information is no longer online ] for a list of the projects competing for the TIFIA loans.. Because only $1 billion is expected to be available this year for TIFIA loans and many other projects address significant existing congestion and have a higher share of private sector support, it remains highly unlikely that the Knik Arm Bridge application project for a $500 million loan will qualify for federal funds. Hemenway describes a prospective TIFIA loan as “very valuable” for the project. In legislative testimony last March, KABATA made reference to a 500 page draft public private partnership agreement that would serve as the contract between KABATA and the developer if the legislature passed the state guarantee contained in HB 158. The draft agreement was produced by California-based law firm Nossaman LLP with input from the Department of Law, KABATA, and representatives of the Governor’s Office. That agreement was described as a work in progress and was not made public during the legislative session. In August, 2012 a Public Records Act (PRA) request to KABATA for the latest draft agreement was submitted. KABATA CEO Andrew Niemiec denied the request citing the “deliberative process” exception to the PRA. However, the “deliberative process” exception does not apply if the information has already been made available to some members of the public. As a result, the PRA request was renewed. KABATA released the draft agreement on September 25, 2012. That draft was labeled “Industry Review Draft” and dated 12/8/11 or a month before the 2012 legislative session convened. The 12/8/11 “Industry Review Draft” draft which was labeled “Confidential-Not for Public Disclosure or Further Information” was apparently confidential to the legislature and the public as the legislature considered HB 158 but had been reviewed by the three bidding teams prior to the legislative session. The agreement would presumably be signed by KABATA and the developer if the legislature had passed the state guarantee in HB 158. That guarantee would require the state to make up an estimated $3 billion in availability payments paid over 35 years to the developer. A critical issue in the House Finance Committee hearing on 3/23/12 was who held the financial risk of the project. While KABATA representatives talked of the project as a public-private partnership with the private partner taking the financing risk of the project, in response to questions Mr. Jeff Stark, assistant Attorney General for the State of Alaska made it clear that if there are not sufficient toll revenues, “the state is on the hook” to make up the additional funds necessary to pay the annual availability payments to KABATA’s contractor regardless of the amount of toll collected. HB 158 passed the Alaska House of Representatives last year but died in the Senate Finance Committee. In the 14 months ending August 31, 2012 KABATA has paid the law firm of Nossaman LLP $1,400,420.24 to draft the proposed agreement (p. 488 ). Since Nossaman LLP also pays KABATA traffic consultant CDM Smith and Citi for providing the financial plan, it is not clear exactly what the cost to KABATA has been for the legal work done to date but it is likely it has exceeded a million in the past year alone. At the October 11, 2012 KABATA Board meeting CFO Kevin Hemenway announced that as of September 30, 2012 KABATA has spent $71.9 million on the project with $29.1 million remaining of federal and state funds presently obligated to the project. Apparently some of the Government Hill property necessary for the East approach to the Bridge has now been acquired even though the project lacks any financing. At its October Board meeting KABATA also announced plans to reintroduce HB 158 when the next legislature convenes in Juneau in January 2013. KABATA officials are planning slight revisions to HB 158 which passed the House but died in Senate Finance last year. It is expected that this will be the third year KABATA will ask the legislature for the unlimited state guarantee the project needs to move forward since the developers apparently do not believe KABATA’s estimate of $4.2 Billion in toll revenue over 35 years is accurate nor do they want to assume or share the risk of covering the expected toll shortfall. At its October, 2012 Board meeting KABATA disclosed that Legislative Budget and Audit recently hired separate experts to review the draft public private agreement and the traffic and toll studies KABATA has relied upon for its Financial Plan. It is not clear yet whether the Audit will be complete before the new legislature convenes in January, 2013. KABATA has been turned down for a fourth time on its preliminary application for a $300 million low cost federal TIFIA loan. But a new TIFIA round was announced July 27 [ Dead link- this information is no longer online ] by the US Department of Transportation Secretary LaHood. So, this week KABATA submitted a new fifth TIFIA letter of interest application asking for a federal $500 million loan since the new TIFIA guidelines now permit 49% fed financing up from a third. The KABATA application “assumes” that the next legislature will pass the legislation that did not make it through the Senate Finance Committee during the 2012 session to provide the project an additional $150 million and make the project “an obligation of the State” or in effect, provide a full unlimited state guarantee to cover the expected toll shortfall, see p. 16 of KABATA’s application [ Dead link- the KABATA web site is no longer online ]. KABATA agreed with the US Army Corps of Engineers in November, 2011 that the length of the Bridge should be 9200’, a 1000’ longer span than the length used in KABATA’s December, 2011 TIFIA application and financial projections given to the legislature in 2012. The Corps is responsible for permitting the project. KABATA has not yet revised earlier cost estimates that were based on a 8200’ Bridge. At 9200’ the proposed Knik Arm Bridge would be 219’ longer than San Francisco’s Golden Gate Bridge with Knik Arm drivers paying twice the $5 round trip toll rate of a Golden Gate driver using an electronic pass. In January, 2012 the US Corps of Engineers received comments from a number of state and federal agencies concerned that impact of a 9200’ Bridge with 230 acres of fill required on the causeways leading to the span would exacerbate the current siltation challenges in Knik Arm and the mortality rate of juvenile salmon and belugas in Knik Arm. 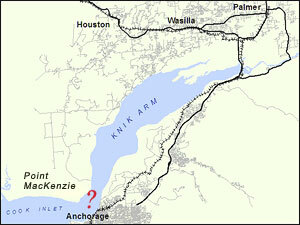 Currently dredging Knik Arm is necessary to keep the Ports of Anchorage and McKenzie open to larger ships. The Corps of Engineers has not yet permitted the Bridge so if it does obtain a permit it is not clear for what length the Bridge span will be permitted for. Some agencies noted that a 14,400’span would avoid Knik Arm environmental impacts; click here for agency comments and click here for Kabata’s response. The critical comments to the project by the State of Alaska Department of Fish and Game can be contrasted with the response of KABATA, another state agency, to those comments. Previously the Alaska Department of Labor had estimated 160,693 people would live in the entire Mat-Su Borough in 2035. KABATA traffic and toll consultant Wilbur Smith, now CDM Smith, estimate for most of the Borough not including the Chicakaloon and Talkeetna area is 191,156 or 19% more. So the overall position of the Parnell administration on the project remains somewhat unclear. What is clear is that salmon runs in the Mat Su the last few years have fallen short of projections and effect of a constricted flow in Knik Arm on forcing juvenile salmon into deeper water could well further impact salmon runs in the Matanuska and Susitna drainages. KABATA has now apparently acquired all necessary commercial and residential right of way property in Government Hill necessary for the project and is now identifying right of way property north of the Bridge site in the Mat-Su Borough. A KABATA contractor is now managing the once privately-owned Government Hill property. While KABATA defends the spending of $15 million for right of way as necessary to keep the project on schedule, there is little precedent for such large right of way costs being expended on a large controversial project that the legislature has twice refused to fund. Finally, Government Hill Community Council President Bob French and south Anchorage financial analyst Jamie Kenworthy have circulated answers to frequently asked questions about the status of the project; for the recent fact sheet click here. Even though there was a flurry of activity in the legislature in the last two months of session and at the Anchorage Assembly, the status of the Knik Arm Bridge is unchanged from last year. So the project remains in apparent financial limbo in regards to moving forward with an RFP. The Alaska legislature approved the Knik Arm Bridge and Toll Authority (KABATA’s) $1,417,700 operating budget for the fiscal year beginning July 1, 2013. However, the State Senate failed to act on House- passed Bill HB 158 which would obligate the state to make up expected toll shortfalls by guaranteeing payments on the expected 35 year agreement with the contractor. As a result, it is doubtful that KABATA has the state backed financial support it needs to release the RFP this year to the three consortiums eligible to bid for the project. The Bridge project was not included in the state capital budget. The regular session of the legislature adjourned April 15 after legislators passed operating and capital budgets which now await final action by the Governor. On March 20, 2012 the Mat Su Borough hired Eldon Mulder for $30,000 to lobby for the project through June (see p. 38 of Alaska 2012 Lobbyist Directory) ( Or view an archived copy here. ) Since October, KABATA has been supporting the Borough with $270,000 for two years of work [ Dead link- the KABATA web site is no longer online ] for planning activities related to the Bridge. On March 23 the House Finance Committee passed a substitute bill (or view an archived copy here. )to last year’s HB 158 sponsored by Mark Neuman (R-Big Lake) that removed the controversial language from last year’s bill making any KABATA contract or bond “obligations of the state.” However, the revised bill handed out at the hearing inserted more complicated language for the state to fund a reserve fund which, after two hours of testimony from both sides and comments from Assistant Attorney General Jeff Stark, the committee came to understand had the same effect as last year’s open-ended state guarantee. On April 11 the House passed HB 158 largely on a party line vote with most Democrats opposing after Rep. Les Gara’s (D-Anchorage) amendment failed that sought to remove any state liability for covering the expected toll shortfall. With no action from the Senate side on HB 158 or SB 80 and no attempt to put the Bridge in the state capital budget, it is now unclear whether KABATA’s draft 1000 page draft RFP will be released this year since no consortium has apparently expressed a willingness to finance the Bridge without the state taking some or all of the risk of covering the toll shortfall. If the state has to make up for the toll shortfall, that it would not reduce future state transportation funding for Anchorage. With expected cutbacks in federal support, the 2035 MTP is counting on state support for roads, public transportation and trails to increase from 18% of the total today to 56% in the future. With all but one of a dozen speakers at the Assembly Public Hearing voicing skepticism about the Bridge project and resolutions from nine community councils opposing the project, most Assembly members expressed concern that projected Bridge deficits would impact needed state funding. The previous Long Range Transportation Plan had a “firewall” between the Bridge and other state funding to AMATS for Anchorage transportation projects. Patrick Flynn’s ordinance to amend the MTP to restore the firewall by forbidding future local or AMATS funding to support the Bridge then passed 9-2 (Bill Starr and Chris Birch opposing) before the full Assembly unanimously passing the amended MTP. With Flynn’s amendment and changes to Eagle River projects, the amended MTP now goes back to the AMATS Technical and Policy Committees for further modification and adoption before submission to the Federal Highways Administration. A number of other developments could affect the status of the bridge project in the coming year. The Legislative Budget and Audit Committee has commissioned a wide scoped audit of KABATA including the reasonableness of the traffic and financial projections, an assessment of the project risks to be borne by the private and public sector, and any changes of scope and costs to the project since the original 2003 KABATA legislation. Click here [ Dead link- this letter is no longer online ] for a copy of LB&A Chairman Representative Mike Hawker’s letter to LB&A staff. The audit is expected to be made public before the next session of the new legislature that convenes January, 2013. The Alaska Department of Labor has released its annual state population projection for 2035 http://labor.alaska.gov/research/pop/projected/pub/popproj.pdf. Mat-Su population 2035 population is forecast to be 160,693, a number consistent with the 159,050 from Scott Goldsmith of UAA’s ISER and used for the Anchorage MTP, see p. 5-2. [ Dead link- this document is no longer online ] KABATA’s traffic and toll consultant Wilbur Smith Associates (WSA) has not released the actual 2035 Mat Su population estimate that it used for the traffic and toll forecast underlying KABATA’s Financial Plan. But WSA did release Traffic Analysis Zone (TAZ) data which totals about 191,156 in the Borough in 2035 without including the area from Talkeetna north or the Chickaloon area. 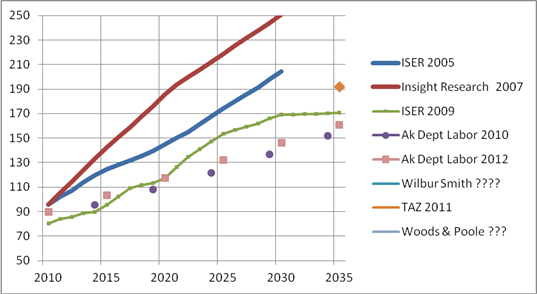 Click here for Scott Goldsmith’s graph comparing the history of Mat Su Population forecasts from KABATA consultants (Insight Research and Wilbur Smith TAZ data) and non-KABATA sources (ISER and ADOL). Two separate March 2012 polls show weak support for the Knik Arm Bridge with only 37% to 39% supporting the project. A statewide Dittman poll done for the House legislative majority shows that 84% of Alaskans have heard of the project. When those Alaskans aware of the project were asked their opinion, only 37% believe that now is a good time to build the Bridge, 58% said later or never, and only 5% were unsure, see questions 18 & 19. Because some officials, including Anchorage Mayor Sullivan, have publicly supported having the state pay for a non-toll bridge, a separate statewide survey done by Ivan Moore tested whether Alaska believed the state should spend $1 billion to construct a two lane, no toll Bridge. Statewide 48% of Alaskans in Moore’s poll oppose the state spending a billion dollars for the Bridge, 39% were in favor and less than 14% were not sure. The $1 Billion number used in the Moore poll comes from$1.086 Billion number in the Knik Arm Bridge and Toll Authority Financial (KABATA) Financial Plan submitted in December 2011 to the federal government asking for a low cost $308 million loan. The $ 1.086 Billion number represents KABATA’s estimate of what the state would pay up front to construct the Bridge and includes no financing costs but does include receipt of the federal loan that KABATA has been turned down for three times. An alternative, independent estimate of Bridge costs that does not include the $308 million loan but does include financing costs and a more realistic toll estimate from independent sources, calculates cumulative Bridge deficits at $2.5 Billion under KABATA’s current public private partnership structure.